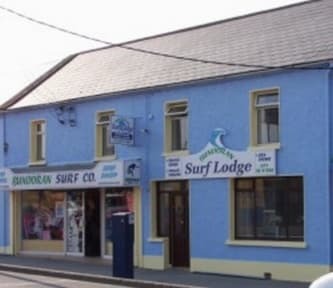 Bundoran Surf Lodge is situated on the main street of Bundoran, close to all shops, pubs and amenities. The hostel is just a 5 minute walk to local surf beaches and reefs, with some of Ireland's best waves in the area. We have private parking at the back and a patio for summer BBQs. We also have a kitchen and common rooms for guests, with free PC, WiFi and movie library. The hostel is a great base for exploring the Donegal Bay area with lots to do and see in the area. The hostel rooms are hotel standard at hostel prices. perfect, i will come back! the staff is like a big family with members from all over the world, very nice and funny people! everybody is super relaxed about everything. the beds feel like heaven when coming home at night, the wetsuits like a (wet and cold, but still perfect) second skin in the morning and there is always coffee that will get you out of the one and in to the other! not only nice staff, also super friendly waves in comparison to france or portugal:D you will feel at home forsure!